Quick Mango Mousse recipe, only 4 ingredients and in 5 minutes. This Mango Mousse recipe is one of the first desserts I learned how to make as a newlywed. That was back when I first started buying cooking books in order to prepare meals for my husband, who at that time had a broader culinary experience than I did. This is a very easy and quick recipe to make, and it only requires a few ingredients. 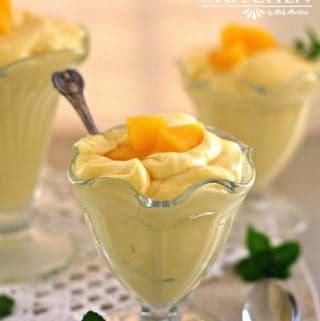 I promise you that you will impress your family and guests with this Mango Mousse! I used DOLE® Mango slices (the ones that come in a jar) for this recipe; the fruit always looks beautiful and has a nice texture. I love to have these types of canned fruits in my pantry since they are so convenient and I love their quality. The best part of them is that no matter what season of the year you’re in, you can always make this type of dessert for your family with Dole canned fruits! It really makes life easier for today’s moms. And now, let’s enjoy this Quick Mango Mousse Recipe! Open the cans of DOLE® Mango Slices and drain the syrup. Place the ½ cup of syrup in a small bowl and stir in the unflavored gelatin. Mix well. Pour this mixture into a blender or food processor along with the mango slices, heavy cream, and condensed milk. Process for about 1 minute. Serve in dessert bowls. Dice the 2 reserved mango slices and garnish the mousse with them. This Mango Mousse recipe is one of the first desserts I learned how to make as a newlywed. That was back when I first started buying cooking books in order to prepare meals for my husband, who at that time had a broader culinary experience than I did. Open the cans of DOLE® Mango Slices and drain the syrup. Reserve ½ cup of the syrup, as well as 2 mango slices (for the garnish). Place the ½ cup of syrup in a small bowl and stir in the unflavored gelatin. Mix well until the gelatin is completely dissolved. Pour this mixture into a blender or food processor along with the mango slices, heavy cream, and condensed milk. Process for about 1 minute, or until it is smooth and thick. Leave a comment and share your experience with the recipe. Check this Easy Mango Pie recipe! This is a sponsored conversation written by me on behalf of Dole Sunshine Latino. The opinions and text are all mines. Thank for this recipe. It was easy to make and the kids love it. Now, the want it again! Thank you for asking, I had to search if there was another form of condensed milk, but this is what I found. If i dont have Mangoes, can i use Mango pulp? Use 1 cup of mango pulp. Hey mmartinez. I want to try out your recipe for a mousse cake, but would it require more gelatin in such case in order to not fall apart? IF you want to try it for a cake, as a filling, you will need to double the amount of gelatine.